Islamist Watch has recently written a lot about charities that operate as fronts for the Muslim Brotherhood. But all sorts of Islamist movements run charitable organizations, not just the Brotherhood. A closer look at all these different Islamist charities shows that the humanitarian facade is a thin one. Take Helping Hand for Relief and Development (HHRD), a prominent Islamic charity regularly praised by both the government and media. HHRD is closely aligned with Jamaat-e-Islami, a South Asian Islamist group complicit in acts of mass-murder during Bangladesh's 1971 Liberation War. In 2006, Helping Hand gave money to "the Al-Khidmat Foundation, a Pakistani charity which gave a 6 million rupee check to Hamas leader Khaled Meshaal in 2006." Al Khidmat, Pakistani media reports, is the charitable wing of Jamaat-e-Islami. HHRD appears to serve as a sister organization of the Islamic Circle of North America (ICNA), which has publicly identified itself as a Jamaat-e-Islami organization. And importantly, as with all Islamist charities, it frequently hosts extremist clerics at its fundraising events – perhaps the most obvious indication of its Islamist agenda. On June 1, HHRD is hosting an "Iftar Dinner" at the Holiday Inn in Somerset, NJ. Two of the three listed speakers are of particular concern. One of them, Siraj Wahhaj, is a prominent imam with a long history of extremist links. In the wake of the 1993 World Trade Center bombing, authorities discovered that Wahhaj and his mosque were closely linked to the mastermind behind the attack, the late Omar Abdel Rahman. U.S. attorney Mary Jo White named Wahhaj an unindicted co-conspirator. Islamist Watch has published quite a lot of research about Wahhaj. He has called on American Muslims to carry out jihad, and to send weapons to Muslims around the world. He advocates stoning adulterers and cutting off the hands of thieves. He advises his congregants: "Take not into your intimacy those outside of your race. They will not fail to corrupt you." The other speaker, Qasim Mazhar, is a New Jersey-based activist who is closely involved with Young Muslims, the youth wing of Jamaat-e-Islami in America. Just like Wahhaj, Mazhar also does not hide his hatreds. Mazhar has described Israelis as "The biggest terrorists in the world," and demanded that "Allah destroy them in this life and burn them in the next." He jokes that upon arriving at an airport, he "landed safely despite the Torah reading Jew," and boasts of visiting synagogues wearing t-shirts that call people to "Rise for Gaza." 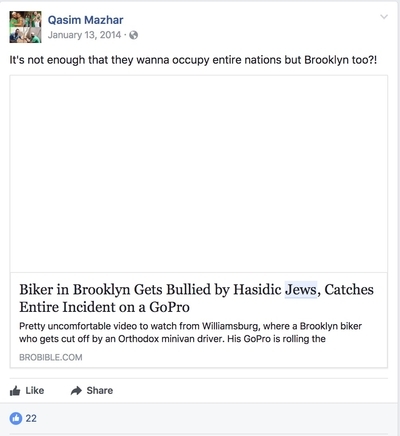 He also claims that Hasidic Jews "wanna occupy whole nations," and he 'liked' a comment on his Facebook page that states "it's in their blood to oppress whenever there's a chance." This overt anti-Jewish rhetoric is not unusual among Islamist clerics, nor Islamist charities like Helping Hand for Relief and Development. In fact, HHRD has a long history of promoting extremist speakers. 1) They provide aid abroad to areas under Islamist control, or areas in which Islamists would like to obtain more influence. In the Gaza Strip, for example, Western Islamist charities provide the social services for which the ruling terrorist group Hamas takes credit. 2) They help Islamist organizations to legitimize their leadership over Western Muslim communities. Charities are among the best-known and most-reputable fronts for Islamist groups. When the media reports on the charitable endeavors of particular Muslim communities, it reflects well on the Islamists who run them. 3) They serve to distract from Islamists' extremist links and histories of inciting hatred. Tell the Holiday Inn to cancel this event. Tell them to stop hosting events featuring anti-Jewish and pro-terror speakers. If Islamism is to be stopped, we must all expose their extremist ideas and stop companies from inadvertently legitimizing Islamists as benign forces within the Muslim community.